I’m finally getting my holiday post up, a bit tardy I must say. This one is a real departure for this blog, which thus far has all been Scotch whiskies. The Mars Shinshu Iwai is, as you would guess, from Japan. The style is different from what I’ve been reviewing here, as it is an American ‘whiskey’ style — corn mash, shorter maturation (but one would assume at higher temperatures than Scotch, as typical for American whiskies). Oddly the Iwai folks spell it ‘whisky’ on the bottle like the Scotch. The importer’s website tells us that the moniker Iwai comes from Kiichiro Iwai, a ‘silent pioneer’ of Japanese whisky-making. With a little digging (thanks to gourmantic.com) we find that Iwai-san ran the Mars distillery years ago. The timeline they give is confusing, as the Mars distiller was licensed in 1949, commenced producing in 1960, but according to Gourmantic, Iwai-san had sent a junior member to Scotland to investigate their whiskies in 1919. At any rate, the distillery is in the Japanese highlands — 800m above sea level, a decent highland for sure. On Tokiwai Imports’ Resources page, if you wait for the image to load you can read a bit more: The regular Iwai is corn-majority mash, and aged in ex-bourbon barrels. The Tradition, subject of this review, is aged in sherry, bourbon and wine casks. No idea from that if it is a blend or a single malt. The Gourmantic site states it is a “Pot Still Blended whisky.” So, a vatted malt in Scotch parlance. Hey who’s photobombing my shot? Enough of the provenance, how does it taste? I’m no bourbon expert, so I compared it to a well-known American bourbon, Bulleit. This is a real departure for me, as previously in my life I had really overdone bourbon (as a kid) and could not stand it for a couple decades. It’s different than Scotch, for sure. The nose of a bourbon tends to be grassier, have more lighter aromatics from the wood (which is of course true first-fill cask!) and less maltiness than your typical (and by law, all barley malt) Scotch. As for color, you can see from both shots this is quite a dark spirit. That may well be from the sherry and wine butts, but we know that distillers even in Scotland are open to adding colorant. I have no idea what the laws are in Japan, so take the color for what it is – color, no more. As one learns from Laphroaig, color isn’t taste. Nose: Green grass, lemon, oak tannins and a touch of vanilla, sweet. Pleasant, refreshing, fairly complex. Palate: Very smooth at first – like liquid toffee, green and red apple, with oak coming to the fore at the end. Cleans up quickly with some bitterness – I don’t know if this is from the wood being true first-fill or what, but the dryness you get from this is edgier than what you get with tannins in a single malt Scotch. Perhaps they toast the casks differently in Japan? Bottom line: The story Gourmantic relates about the younger man being sent to Scotland and finding the spirits there too robust for the Japanese palate ring true to me. The modern Japanese certainly get around gastronomically but flavors are relatively muted when you encounter in Japan robust cuisines such as Italian. So it’s no surprise this is a gentle whisky. A good refreshing summer swallow. In comparison, Bulleit, with a more robust nose (which has a good whiff of malt, pears and oak) is more muscular from start to finish. In comparison, Bulleit’s nose comes across as downright skanky. Due to Bulleit’s higher (45%) ABV, it is harsher going down, but the Bulleit’s tannins are a tad less edgy than Iwai’s. 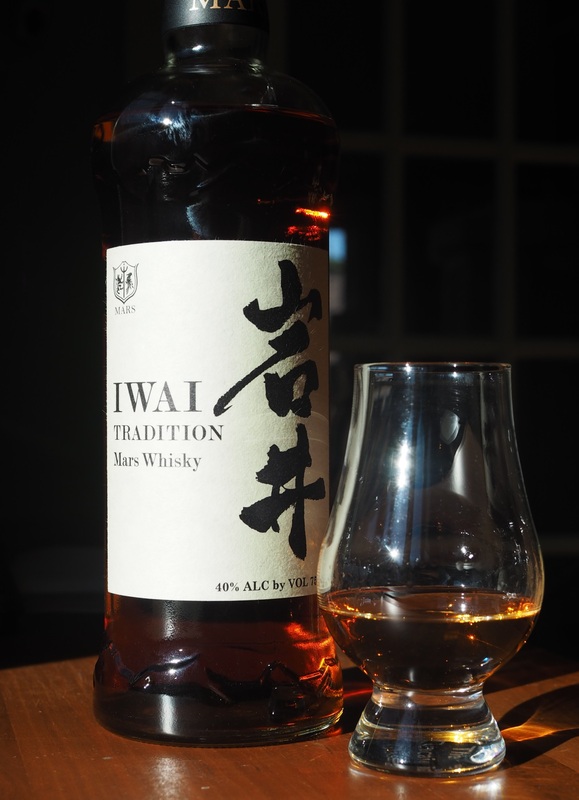 All in all, at double the price of Bulleit, Iwai delivers a more refined experience. 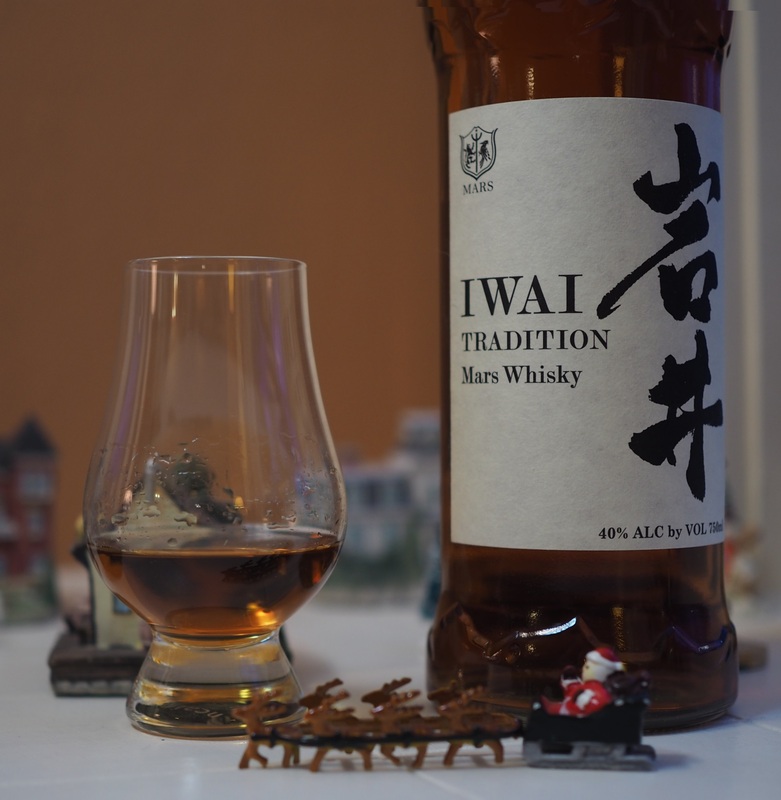 Compared to another light, refreshing bourbon (Stein, Oregon micro-batch I will review soon), Iwai still has a cleaner, more refined nose and a richer mid-palate. Iwai Tradition is to be savored straight, it would not hold up to mixers, and at the price, should not be misused that way anyhow. By the way I try to ignore tasting notes before I review a whisky. Everyone’s nose is different and I don’t want the notes to suggest flavors a priori. The importer claims “Ripe cherry, honey toffee with a beautiful ginger spice.” Pretty darn close. Yes, that black-and-red pepper is better described a ginger. This entry was posted in Japanese whiskey, Whisky and tagged Iwai, Iwai Tradition, Japanese whiskey, Mars Whisky, Whiskey. Bookmark the permalink.